Brussels sprouts | Cooking Ripe! Today was a Bountiful Basket day, which is always a good day. I get so excited to see what arrives on the truck. Today’s haul was really exceptional because it included a few things I haven’t tried to cook with yet: water chestnuts and spaghetti squash. I’ll keep you posted on how those work out, but while I was helping at the pick-up site, I heard several people grumbling that they were not excited about the very large bag of Brussels sprouts we were getting. Why, oh why can’t we get past the sprout hating, people? Just because grandma boiled them to death and made you eat those slimy things, doesn’t mean they are inherently yucky. After all, they’re just mini cabbages – do you like cabbage? Ok, if you said yes, then you like Brussels sprouts. The end. I know my fellow Bountiful Basketeers are scrambling to find recipes to try with their bag o’ sprouts, so I thought I better get this one posted ASAP. I like Brussels best when they are crispy, and while I have oven roasted them in a few different ways (see Crispy Parmy Sprouties), I haven’t tried them on the stove-top before tonight. Since the oven was busy making a meatloaf (yeah, my carnivorous husband insisted I feed him meat “for a change”), I decided to make some skillet sprouts. I was hoping to attain some crispiness, so I opted for a caramelizing technique…and to do that, I did something I almost never do: I used BACON. Only two strips, though! The result was just what I wanted: crispy, tasty, salty and savory. Mhmmm…I can pretty much guarantee that your whole family will jump on-board the Brussels flavor train with this recipe. You can’t go wrong when you’re cooking with bacon, right? Slice up about half an onion – more or less to suit your tastes. Place two slices of bacon in the skillet set to medium heat. After it cooks for a few minutes, add the onions. Keep the heat to medium, or medium-low, so they don’t cook to fast. Quarter the Brussels by slicing them lengthwise. I started with about 10 large sprouts. When the bacon is cooked through, but not crispy, remove from the skillet so it doesn’t overcook. Chop it up to add back to the skillet later. 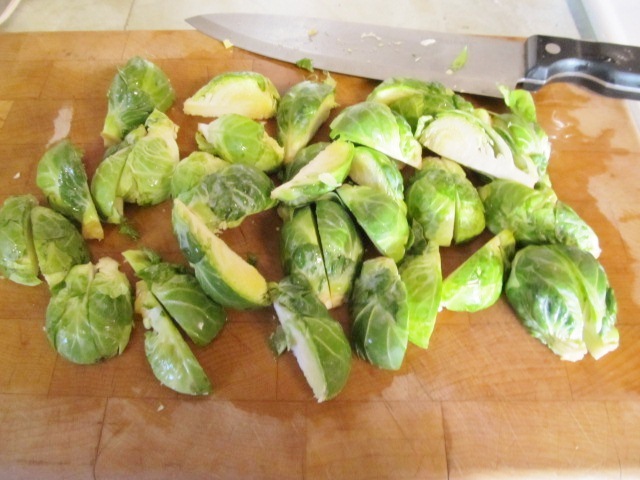 Add the quartered sprouts to the pan and continue cooking on medium-low heat. Depending on how much bacon grease remains in the pan, you might need to add some extra virgin olive oil to the pan. My bacon wasn’t very thick, so I needed to add a good drizzle. I probably left my skillet cooking for about 20 minutes. It’s important not to rush the cooking, or they’ll end up cooked on the outside and still hard and uncooked on the inside. Stir occasionally. Once your onions and sprouts start getting that happy caramel brown color, go ahead and add the bacon pieces back in. Once the bacon is crisp and the sprouts are sufficiently caramelized (dark golden brown), they are done and ready to eat! Heat skillet to medium heat. Add bacon, then onions after a few minutes. Quarter the Brussels sprouts, lengthwise. 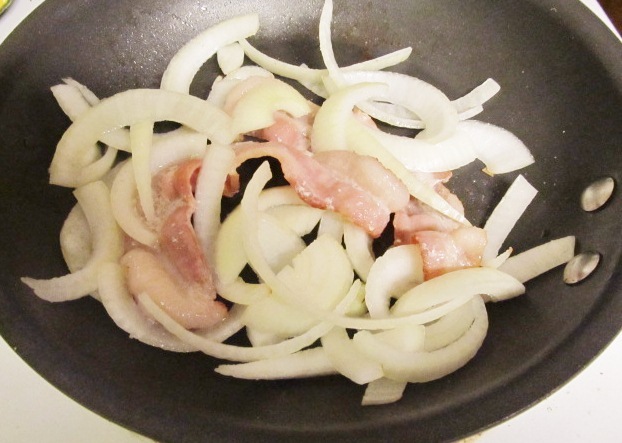 When bacon is cooked through, but not yet crispy, remove from pan and chop up, reserving for later. 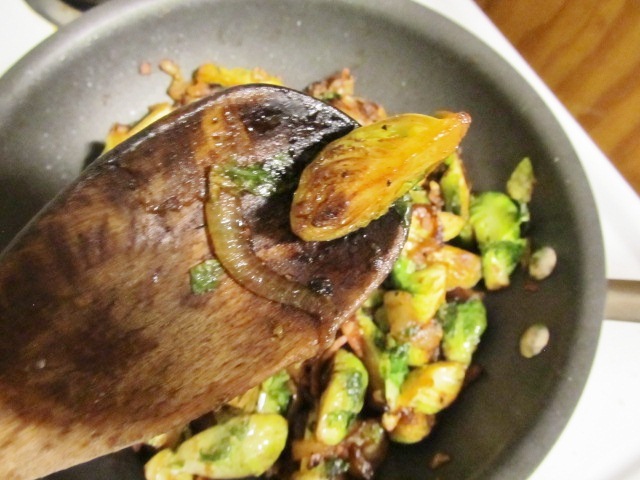 Add Brussels to skillet and continue cooking over medium-low heat. Add a drizzle or two of olive oil, as needed, depending on amount of bacon grease remaining in the pan. Salt and pepper to taste. 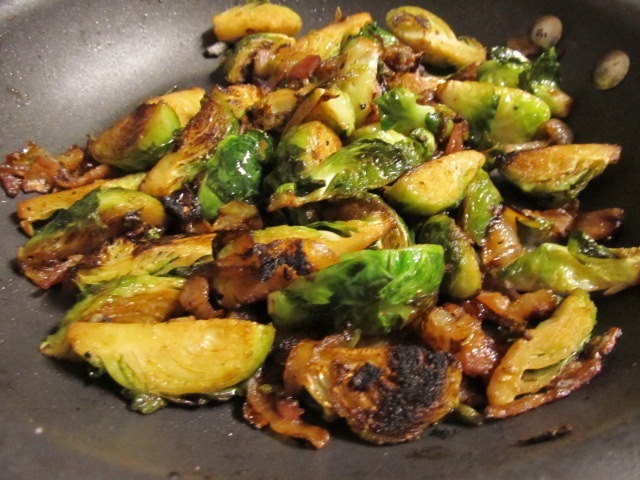 Once onions and Brussels turn a dark golden brown (about 20 minutes), add the bacon back into the pan and cook until it crisps up. The Hubs and I were pretty pleased with how these turned out, so I wouldn’t change much. I did think that it might have been pretty to add some carrots, which would also taste great with bacon and onions. Another idea: instead of bacon, you might use diced ham and make it more of a skillet meal. Simple, right? I do feel a little bad about the bacon, but it was only two slices – and, honestly, it would have been fine with only one slice. I am pretty certain that even the sprout haters will like this recipe, so give it go and see how it goes over at your dinner table. See my Brussels Sprouts board on Pinterest for more sprout recipes. Categories: Cooking, Sides, Vegetarian, Veggies | Tags: Bountiful Baskets, Brussels sprouts, Cooking, easy, food, Fresh, Harvest, healthy, nutrition, onions, recipes, vegetables, Vegetarian | Permalink. It’s like the presidential race: either you’re on one side of the aisle or you’re on the other. Either you love Brussels or you gag at the idea of them. If you’re a gagger, I probably can’t sway you to my side of the aisle, but if you’re leaning across the aisle and are open-minded about another point of view, this recipe might win your vote. I don’t know why Brussels are so vehemently despised, but it’s likely due to bland and boring cooking techniques. 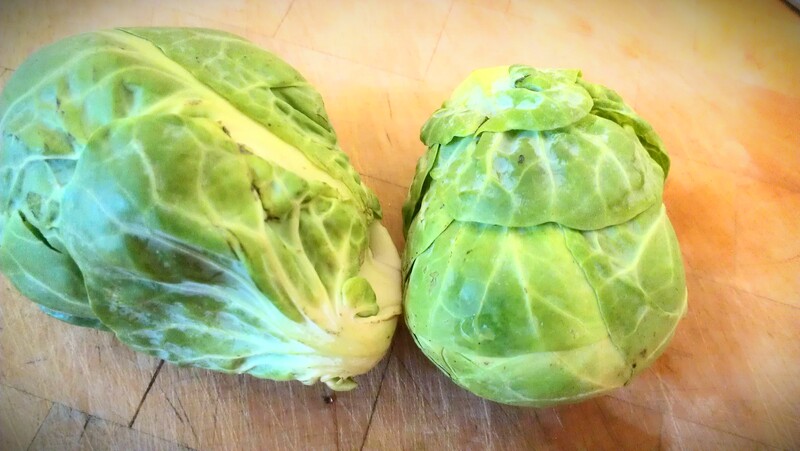 Brussels are just mini-cabbage and people don’t generally hate cabbage, so I think they’ve gotten a bad rap. Recently I got a big bag of ginormous Brussels in my Bountiful Basket. SIDEBAR: While I grow a lot of my own veggies, I also get tons of produce from Bountiful Baskets, which is an all volunteer food co-op that distributes produce baskets to participants every other week in communities all around the country. To me, the best part – well there are two best parts: the first best part is that a basket is only $15 and the second best part is you never know what you’re going to get! Surprise produce! My tiny community just started participating in the co-op this summer and I have so much fun figuring out what to do with my basket items every two weeks. I end up trying new fruits (have I mentioned that while I love veggies, I’m not exactly a fruit enthusiast?) and veggies that I would have ignored at the store. If you’re not growing a garden, or you want to supplement your garden, you should really check out Bountiful Baskets to see if they are coming to your area – and if not, you could help start a new site. Anyway, where was I? OH, I got some Brussels in my basket a few weeks ago and wanted to try out some new recipes. 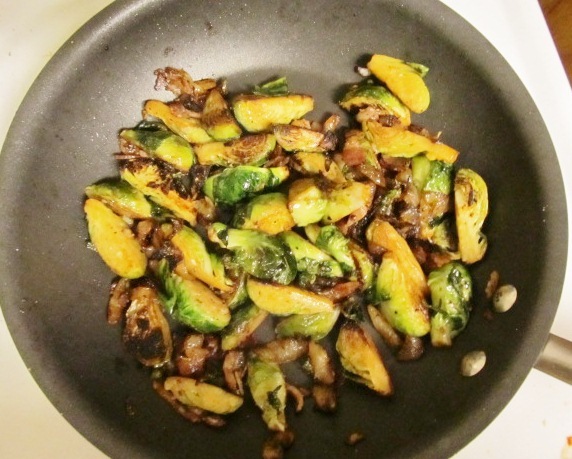 The Hubs loves Brussels (because he love cabbage), but when I made the first batch, using this recipe for maple cayenne roasted Brussels, he looked skeptical and said, “I don’t know about this. I like them cooked the regular way.” When pressed about what the regular way might be, he didn’t have a clear answer and started eating instead. Of course he thoroughly enjoyed them and forgot about that other regular way. Easy win. 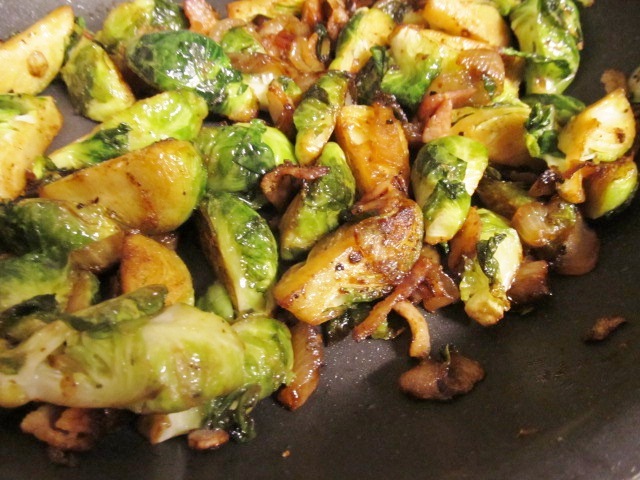 But, I had a lot more Brussels to get through, so I decided to try something new the next time I made them. 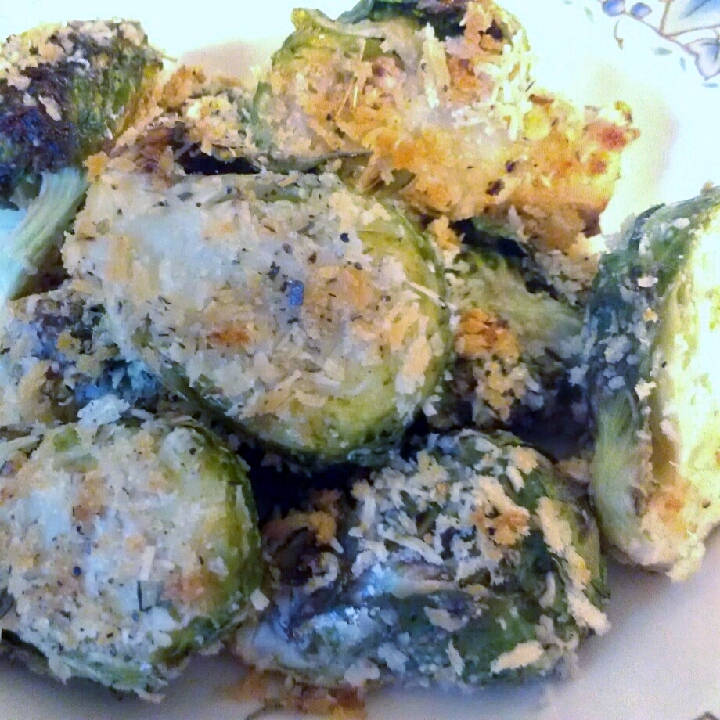 I call them Crispy Parmy Sprouties (leaving out the Brussels part is my way of being covert). The concept is pretty basic and one that will work with many other veggies, like zucchini, eggplant, carrots, onions – ooo, and I just thought of asparagus, which would be really yummy done this way. Easy process: dip in egg, dip in seasoned panko (breadcrumbs) and bake. Start with clean, dry Brussels. Discard any brown leaves and slice in half lengthwise. The crispy part comes from the panko breadcrumbs. If you haven’t used panko yet, it’s very versatile – and inexpensive – and you can use to coat chicken, veggies, seafood, etc., but it’s lighter than regular breadcrumbs. It’s what they use to make the breading on crunchy Japanese fried shrimp, veggies, etc. You can find it in the baking aisle of the grocery store nowdays. If you are making this tonight and don’t have panko, use regular breadcrumbs. Grate the Parmesan cheese (you can sub asiago, or other hard cheese, but you MAY NOT use that dry stuff in a green shaker can that they sell in the Chef Boyardee aisle!) and mix with the panko bread crumbs in a shallow plate or pie pan. Add the spices and mix by hand. Beat an egg (or a couple of egg whites) in shallow bowl. 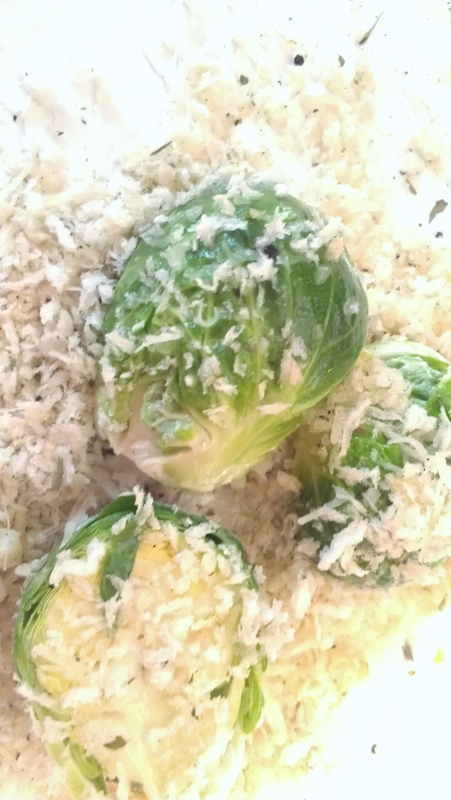 Dip the Brussels in the egg, then in the panko/parm mixture. 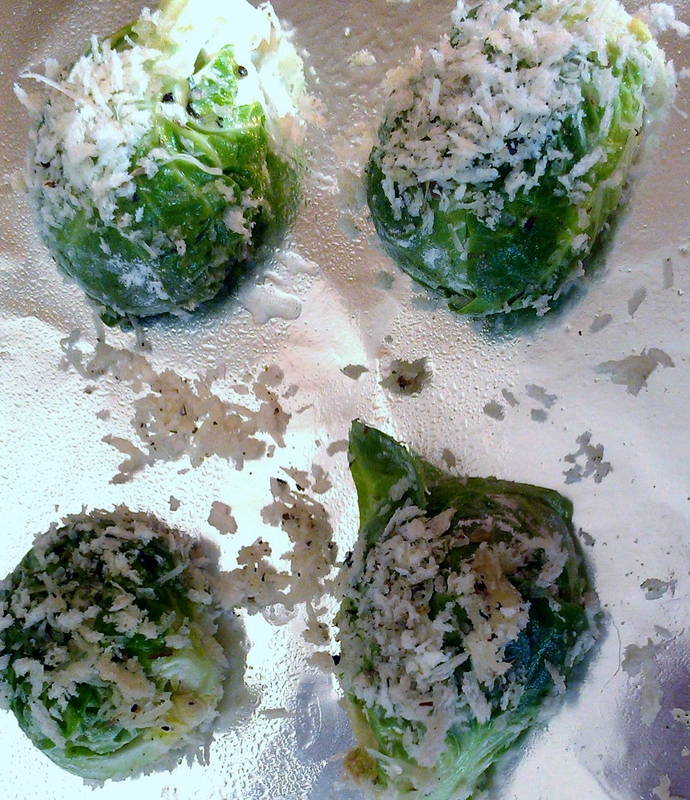 Roll those Brussels around and press the mixture into the egg coating, then place on the baking sheet. Pop into the preheated oven and cook for approximately 20-30 minutes. My sprouts were huge, so they took about 30 minutes, but check yours at 20. They should be crispy and golden brown – and you will smell the cabbage aroma. Poke them with a knife to make sure they are fork-tender inside. I like mine more done than not, so I tend to let them get fairly soft inside and crispy on the outside. If you want to get them crispy on all sides, carefully (think tongs not spatula) flip them halfway through the cooking time. Preheat oven to 375 degrees. Coat a baking sheet with cooking spray (or cover in foil and spray for easier clean up). Break egg into a shallow bowl and lightly beat. Combine panko, Parmesan, Italian seasonings, garlic and salt and pepper in a shallow dish or pie pan. Dip each Brussel half into egg, then into panko mixture. Toss to coat well and lightly press mixture onto sprout. Bake for 20-30 minutes, carefully turning once halfway through cooking time. 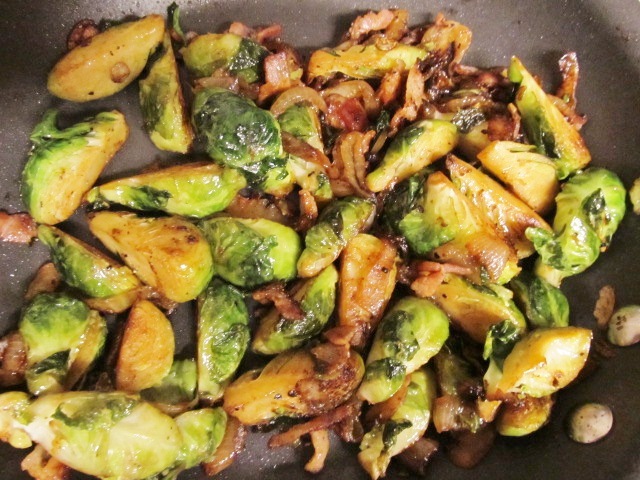 Brussels are done when you can smell them, are fork-tender and golden brown and crispy on the outside. Serve and eat immediately for best taste! Notes for next time: Hubs had no criticisms to offer on this one! Next time, I might lightly spray the uncooked sprouts with some cooking spray just before baking for even more crispiness. 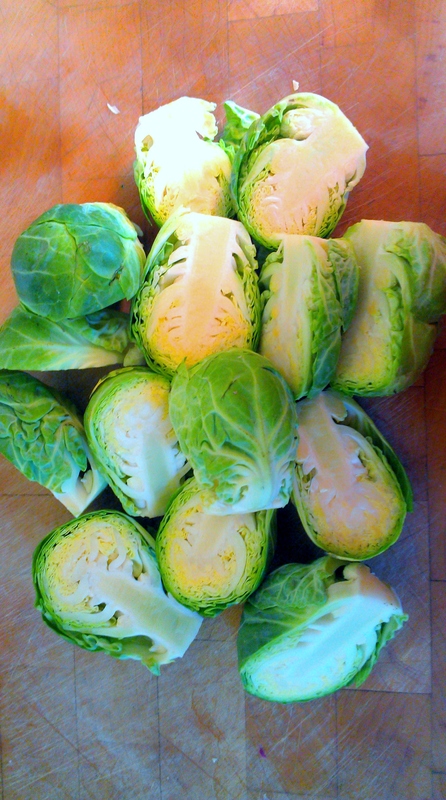 Another idea – to cut cooking time – is to cut the Brussels into quarters instead of just halves. OH, and pizza sauce or marinara might make a fun dipping sauce. Categories: Cooking, Dinner, Sides, Vegetarian, Veggies | Tags: Bountiful Baskets, Brussels sprouts, cabbage, Cooking, easy, Fresh, Garden, Grow, healthy, ingredients, low-fat, nutrition, panko, parmesan, recipes, simple, vegetables | Permalink.